We’ve all got one, or more than one, lurking at the back of our cupboards – that budget saucepan that we took to uni and that somehow made it back, or that much-loved but much-scratched frying pan we’ve been using for thirty years or more. But if you’re a frequent or particularly enthusiastic cook, it makes sense to invest in a solid set of pots and pans. What makes the best pots and pans can vary depending on your needs. Bog standard aluminium pans may be perfectly good as a first set for a young person flying the nest and striking out on their own, as they’re inexpensive and light to carry, and are good conductors of heat. However they don’t tend to have the lasting power of more expensive materials, and will likely need replacing within a few years. Hard-anodised aluminium, on the other hand, has a surface that has been electrochemically treated to resist wear and tear, and unlike uncoated aluminium, can handle acidic foods. Like their uncoated cousins however, they are lightweight and heat up quickly with no hot spots. Stainless steel is the most expensive of the materials commonly used for saucepans, but if you’re happy with the expenditure, it pays off in the material’s durability, non-reactive nature, and the fact that it’s dishwasher safe, which some hard-anodised pans may not be. If you have an induction hob, you might have struggled over the years to find a compatible set of pans that also performs well, but you’ll be pleased to know that almost all of our picks are induction-compatible. We’ve made a point to mention where pans are, or aren’t compatible with all hobs, but if you’re concerned, be sure to check the manufacturer’s website. While it goes without saying that looks aren’t everything when it comes to what performs in the kitchen, it’s hard to deny the instant appeal of these pans: with delicately speckled shells and smart reflective hardware, they’d make an eye-catching addition to any cupboard. They’re suitable for use on induction hobs, their curvy handles are comfortable to hold, and perhaps best of all, their toughened aluminium ‘Neverstick2’ coating is designed to let you cook without butter or oil for healthier dinners, without the trade-off of spending hours scrubbing. For their effortless meeting of style and function, they bag our top spot easily. A space-saving design that also saves on washing up? Now that’s Ingenio. 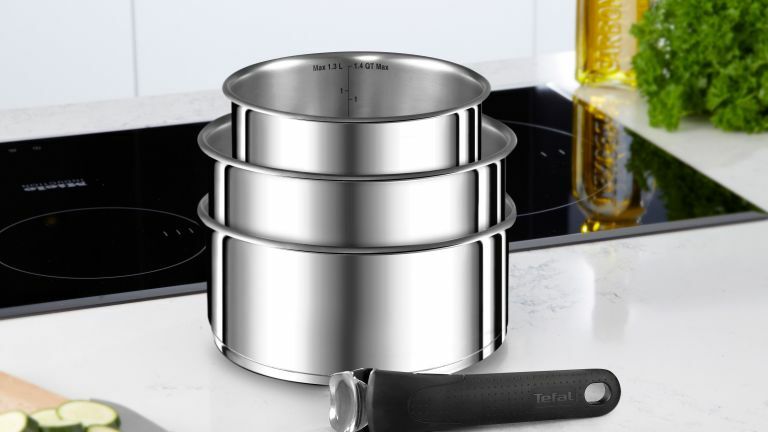 The Tefal Ingenio isn’t so much a traditional saucepan set as an all-in-one cooking and serving solution. Offering easily the most versatility of any of our picks, it comes in the form of three handleless pans and a separate clip-on handle, which just so happens to be oven-safe, meaning you can take it from hob (including induction), to oven, and then straight to the table. The separate handle, plus the ability of the three pans to nest inside each other neatly, means they take up less space in the cupboard than your average pan set, so for those with tiny kitchens, or those creative home chefs who do a lot of multi-phase cooking, they’re well worth considering. The price for a three-piece saucepan set might, on first inspection, be eye-watering, but there’s a very good reason that Le Creuset cookware commands it as a stone-cold kitchen classic. Unlike most Le Creuset products, which are made of hefty cast iron, these pans bring together the finest features of both stainless steel and hard-anodised aluminium for saucepans that represent the best of the both worlds, offering durability and conductivity. To prove they can walk the walk, they also come with a lifetime guarantee, and are induction hob-safe. Judge are famous for their stainless steel cookware, and these pans more than live up to the company’s long-standing reputation for quality and durability. With an attractive mirror finish and unusual bell shape that sets them apart from much of the competition, they look great on the hob, in the cupboard, or hung up to be shown off. The biggest attraction, though, is the thorough, even heating that those stainless steel bases offer, meaning less potential for accidentally burning that otherwise beautiful béarnaise. That the set also comes with a frying pan, and for around £120, represents superb value. In a slightly different configuration to our previous five-piece saucepan set from Judge, this versatile set of Lakeland pans eschews the fourth saucepan in favour of a second, smaller frying pan. This can come in very handy for achieving those perfect over-easy eggs at the same time as attending to a family-sized fry-up. Safe for use on all hobs, and oven-safe to 180 degrees celsius, these hard-anodised aluminium pans are very user-friendly, also upping the capacity with their extra-tall design, offering triple layer non-stick interiors for easy cleaning, and heat-resistant handles for even easier handling. This hard-anodised saucepan set combines the know-how of cookware experts Tefal and ultimate foodie Jamie Oliver for a properly chef-friendly addition to the arsenal. Their solid aluminium core is designed to offer quick, even heating with no risk of hot spots; the non-stick coating is reinforced with ultra-tough titanium particles, promising to be fantastically durable even in the face of everyday use; and the sturdy riveted handles employ silicone inserts for a comfy grip. A versatile and long-lasting set for enthusiastic cooks. In high-grade stainless steel and tempered glass, these pans are clearly beautifully built, but more than that, they’re simply… well, beautiful. The matte taupe finish, curvy two-toned handles and unusual lid-top loop all go to show that pans aren’t as samey as we might have once though, and that these beat the competition hands-down for gorgeous design. Not just a pretty face, they use an encapsulated stainless steel base for effective and even heating, while the sides remain cool to the touch and the silicone handles stays comfortable, even while showing off those pancake-flipping skills. The very definition of cheap and cheerful, this colourful set comes up trumps with our best pans for students. To find a decent quality five-piece pan set for this price, not to mention ones that are properly non-stick and suitable for use on induction hobs, is an unexpected treat. Reviewers were blown away by the quality of the non-stick coating, commenting on how easy the saucepans and frying pan were to clean, and were particularly taken with the cupboard-brightening lime green shade, a far cry from the usual grey and black. Still looking for that perfect frying pan to add to the arsenal? Take a look at our list of the best non-stick frying pans.